It's almost time for the Season 5 premiere of Mad Men which airs Sunday, 3/25. Are you a Mad Men fan? I sure am. And what better way to celebrate than with a dinner party; virtual of course. A great bunch of food bloggers (you can get the entire list here) are coming together on 3/18 to bring you some of Don Draper's favorite foods and drinks that have been included in the Unofficial Mad Men Cookbook, written by Judy Gelman and Peter Zheutlin. There are over 70 recipes in the cookbook and we'll be featuring a bunch of them on our blogs. We'll also be tweeting about these yummy retro dishes on 3/25 at 8pm EST using the hashtag #PartyLikeAMadMan So be sure to join us. 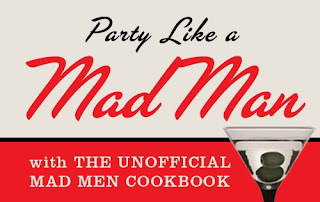 The Unofficial Mad Men cookbook is more than just a cookbook it's packed with period detail; every recipe authentic to the time. It provides an inside look at Manhattan's most legendary restaurants and bars. And all recipes include commentary from the Mad Men episode they appeared on. The book is divided into categories like any other cookbook. Including one for classic cocktail recipes. What better way to get into the Mad Men "spirit" So pour yourself a drink and getting ready for Season 5. Pour whiskey, vermouth and bitters into a mixing glass with ice cubes and stir well. Strain into a chilled cocktail glass. Garnish with the cherry. Pour whiskey and Drambuie into a mixing glass and stir. Pour into a rocks glass over ice. Great contribution to the party! You can't start a party without some yummy cocktails!